You might be seeing one google ad below this post. I’m going to keep one ad on this page (only one ad) and see if it helps with my hosting costs. if it gets too distracting i’ll remove it. Another fixit type post. Every so often I repurpose my Arduino and EL Wire for a new project, and each time I always forget how to properly get the EL_Escudo library resetup. I should probably just fork the code on GitHub with the fixes that have been posted, but who remembers to do that. “I realize this is a rehash of what others above have said, but I got mine to work by doing the following. 2. They also recommend GND and HVGND are tied together. Look at photo (thanks miku) http://dl.dropbox.com/u/3551240/el-escudo.JPG . With the code change made above I also tried to see if the El Scudo would work without this jumber (between GND and HVGND), and it did work and it did work without it. I was using the EL_Blink.pde example when testing this. The above got things to work with a handheld 3V inverter (two AA battery powered) with the button pressed 3 times (a steady AC supply, no blinking) with the output of this inverter connected to the El Escudo shieldâ€™s â€œEL Driver Inverter Ouputâ€ JST jack. The Arduino was powered from a 5VDC wall transformer (1A capacity) with the barrel jack plug connected either on the Arduinoâ€™s barrel jack connector or connected to the El Scudoâ€™s â€œEL Driver Raw Voltageâ€ JST connector. You will need to fabricate the strange El Wire plugs to JST plugs to make all the connections. In my experience above, the polarity was not a factor because the output from the inverter is AC and so is the input to the el wire. My only issue was with number 1. Fixing that caused the main library to work again. 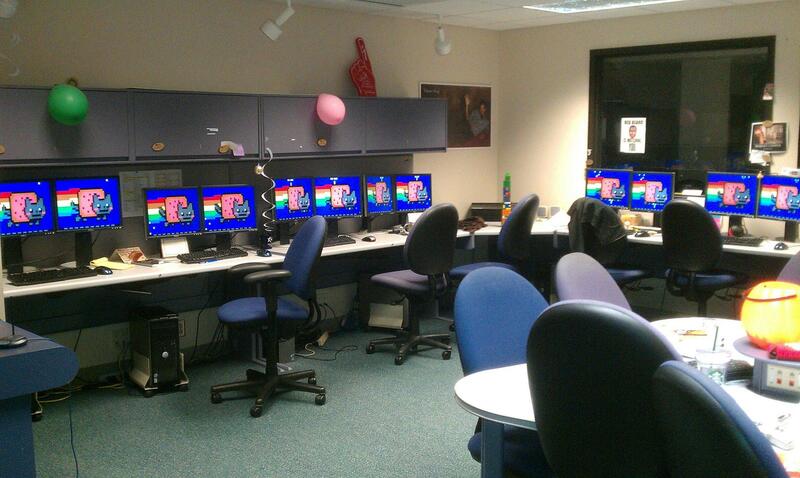 I came in this morning to find that our SysAdmin had made a custom boot image that ran NyanCat (8 bit music and all) on all our machines.